From a staircase to the moon to 130-million-year-old dinosaur tracks, welcome to another world. The dream starts years before, in photos you see randomly, posted by your more adventurous friends. You know the shots: pindan-red earth, impossibly azure ocean and perpetually cloudless sky surreally gather together. Surely, it cannot be like this. Yet, from the first fleeting glimpse of the Kimberley as your plane banks into Broome or Kununurra, it is no less dreamlike. Broome is a laid-back town, an easy-to-get-to-know place with a vibrant, diverse food and social scene that reflects the faces in town, the way they live. Its people appreciate the importance of spoiling a traveller, making them exhale, but also preparing them for what comes next, the likes of the majesty of east Kimberley and beyond. Broome is equally a destination and a gateway to the one of the globe’s last untainted wilderness areas. There is no more dreamlike introduction to Broome than riding a camel into its sunset along Cable Beach, 22 kilometres of gleaming white welcome mat. Attune to Broome time by swaying softly in a sun-silhouetted train of personality-filled camels, while the Indian Ocean blows you a first gentle kiss to greet you. Try to align your Kimberley initiation with the full moon because, when it shimmers across Roebuck Bay’s tidal flats, it is daring you to wander straight into the night sky. The Staircase to the Moon hypnotises the town; locals and travellers congregate on picnic blankets at Town Beach or at perennial faves such as Mangrove Hotel, Matso’s mango beer in hand, to marvel at its magnificence. Venturing into east Kimberley, the infinite splendour of the West Australian outback is most evident at the Bungle Bungle Range, where 300-metre-high sandstone ‘beehives’ stand tall over a landscape where tropical and arid mingle like nowhere else. South of Kununurra, the World Heritage-listed Purnululu National Park geology is 350 million years in the making, yet miraculously it was almost secret until the 1980s. There is no wrong way to witness this remarkable panorama: gape at it from an open-door helicopter; traverse its neck-craning sheerness on a self-drive or organised 4WD tour; and, especially, walk deep inside it, along exceptional Echidna Chasm or via stupendous Cathedral Gorge. A single glance at one hidden piece of pre-Ice-Age Gwion Gwion rock art tells you that the Kimberley has been a cradle for a vibrant Indigenous culture since time immemorial. There are plenty of locals keen to give you a personal, real taste of this ancient lore, too. On Narlijia Cultural Tours, passionate Yawuru man Bart Pigram shares his saltwater-people perspective on Broome; Dreaming stories; ancient shell middens; the life that flourishes amongst its teeming mangroves. And you’ll wander by 130-million-year-old dinosaur tracks along the way. 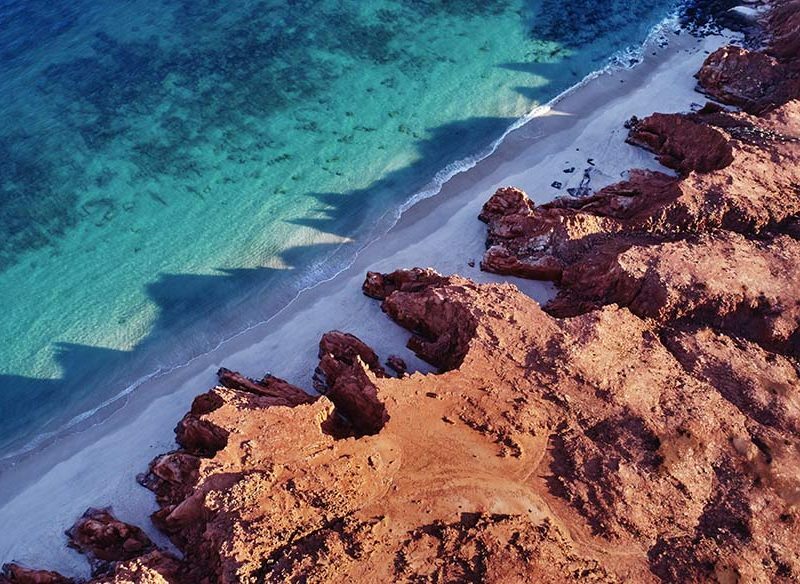 At Kooljaman at Cape Leveque, on the Dampier Peninsula, Bardi man Brian Lee invites you into the turquoise waters of Hunters Creek for a hands-and-feet-on hunting and gathering lesson (Brian Lee Tagalong Tours; own 4WD needed). You’ll learn classic crabbing methods, and then cook your spoils over an open fire. Further explore Cape Leveque’s culinary possibilities on Bundy’s Cultural Tours bush tucker and medicine walk or sharpen your skills on a spear-making tour. The Kimberley wilderness offers a lifetime of options for both the serious 4WDer and those who just want to give it a go. There are few better tasters than the Broome-to-Cape Leveque road trip. In one glorious day you can tackle a sandy red-dirt road, see a cross-section of outback wildlife and visit remote Aboriginal communities, such as Beagle Bay, where the ‘Mother of Pearl (Sacred Heart) Church’ awaits. Take it to the next level on the Gibb River Road, 660 kilometres of rugged Kimberley highlights, all the way to Kununurra. This 4WD mecca funnels you past gorge after gorgeous gorge – like the wonderful Windjana Gorge – into shaded freshwater swimming holes, and through Boab-tree-peppered, country-sized cattle stations such as El Questro Wilderness Park and Home Valley Station. You’ll need a couple of weeks to explore and appreciate these open spaces, and a 4WD, which you can rent in Broome or Kununurra. Feel free to camp out under the clear, dry-season night sky every night, but also know that, in some fantastically remote nooks across the Kimberley, you can find a breathtaking variety of luxury stays. The question is, which one suits your personality? Few outback digs surpass the supreme luxury of El Questro Homestead. Home Valley Station’s creek-side Grass Castles merge nature and intimacy perfectly. Prefer a spectacular slice of Kimberley coastline? Well, you are spoiled for choice, from the exclusive Berkeley River Lodge and the ultra-relaxed Kimberley Coastal Camp to wilderness-embracing Faraway Bay and Eco Beach Resort. One tiny thing that has shaped Broome more than anything else is the pearl. Follow the trajectory of a cultured pearl from ‘shell to showroom’ at Willie Creek Pearl Farm in Broome, and Cygnet Bay Pearl Farm in Dampier Peninsula, then you’re in a state of readiness to browse the glitzy showrooms in town, credit card primed. Along the way, dive into Broome’s fascinating modern history. The town once spawned more millionaires than anywhere else in Australia. In the 1800s, droves of Japanese, Filipino and Malay divers moved to this northern outpost on the Indian Ocean to seek their fortunes, subsequently creating a melting pot of cultures that has made Broome the multicultural town it is today. Ord Valley Muster (17 to 26 May, 2019): the east Kimberley’s week of weeks is one of Australia’s must-see regional festivals. Set in the greatest of great outdoors, it is impossible to pigeonhole this diverse festival, with no less than 30 distinctive events ranging from a rodeo to live music and dining under the stars, reflecting the characters and flavours that make the east Kimberley one of the world’s most well-known and recognised destinations. Shinju Matsuri (7 to 15 September, 2019): The ‘Festival of the Pearl’ encapsulates everything that is Broome. Shinju Matsuri is a great opportunity to sample Broome’s multicultural lifestyle during events such as Pearl Harvest Yum Cha, the famed Floating Lantern Festival and the Sunset Long Table Dinner of Cable Beach. Who do we mean by ‘them’? None other than the world’s largest fish, the whale shark, who calmly cruises the crystal-clear waters of this 300-kilometre-long World Heritage-listed reef from March to August every year. You get plenty of time to appreciate the greatness of these gentle giants as you languidly swim alongside them – or is it they who swim alongside you? – on tours departing the Ningaloo Reef bookends of Exmouth and Coral Bay. There’s no more reliable and ethical place to see whale sharks on the planet; they are not baited, only spotted from planes, just doing what they do. The setting is breathtaking as vivid outback hues make it all the way to shore. Beginning a few flipper kicks from the beach and continuing 20 kilometres into the ocean, Ningaloo is the closest barrier reef on Earth to a shoreline. The beaches lining Cape Range National Park and Coral Bay are snorkelling nirvanas, where besides about 500 species of tropical reef fish and pristine coral gardens (no less than 220 species), you might also encounter dugongs, manta rays, humpback whales, and come face-to-mask with one of the prolific population of cute sea turtles. There are plenty of gems to draw you ashore at the end of the day, too. Catch an Indian Ocean sunset at Vlaming Head Lighthouse or spend a few nights at one of the world’s most impressive glamping sites, Sal Salis. Its luxurious safari tents nestle in the reefside sand dunes. How does sunset canapés followed by a dinner served under the stars sound to you? Qantas flies direct to Broome from Melbourne, Sydney and Brisbane (seasonal) and there are daily connections from Perth to Broome and Kununurra with Qantas and Virgin. Qantas also operates daily flights from Perth to Ningaloo Reef (Learmonth). Visit westernaustralia.com for details on how to plan a trip to any of these incredible destinations in and around the Kimberley and Ningaloo Reef. Taking in so many of the Kimberley’s icons, this popular package offers a sojourn to remember. EXTENSIVE TOURING INCLUDING A SCENIC FLIGHT OVER THE BUNGLE BUNGLES AND MUCH MORE! Escape to the wilderness with this 5 night package. Travel to Kununurra and beyond for a taste of the breathtaking East Kimberley.